Edgewater Haven is located in a park-like setting in view of the Wisconsin River. Edgewater provides 5-star, quality care in a clean and comfortable home-like setting. Our long-term caring staff is dedicated to your loved one's outcomes. Wireless internet access throughout the building as well as computer for residents in the Activity room so residents or families can keep current with their emails or can Skype. Please see the Respite Care page for more information. Please see the Therapy Services page for more information. Please see the Dietary Services page for more information. 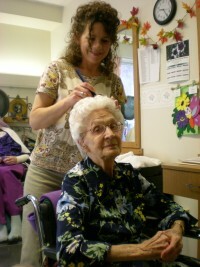 Salon services are provided at Edgewater Haven. Salon services include shampoo and styling, haircuts, perms, color rinses, etc. Appointments can be made through the nurses or social workers. Our trained social service staff aids in all aspects of discharge planning to ensure that you return safely to your home. We are also available for financial resource information and family support. 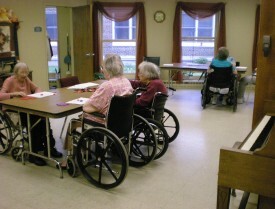 We insure that the transition to long-term care is done with love and support to all involved. A full activity calendar, including night and weekend activities. Our Activity Department is designed to enable the resident to continue to enjoy the experience of life at their highest practical level. Activities include physical, spiritual, intellectual, social groups, community and leisure activities. Our Activity Department is staffed by experienced, trained professionals. There are also community volunteers to provide plenty of one-on-one attention.